I located Táchira flag at <www.funtha.gov.ve>. Coat of Arms at <www.funtha.gov.ve/asamble>. 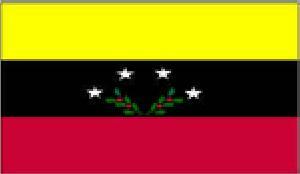 Táchira State - Similar to the Venezuelan flag, this one has, in the middle, a black stripe. Inside it, four stars and two branches of coffee. Looking at the flag which is shown at <www.sofitasa.com/tachira>, one could find out that the arrangment of the stars and branches is different from those on the image above. There are two CoA's....one names Escudo and the other Escudo de Armas. The Flag - Attributes and Meaning: The Táchira State is located in the Andean region to the southwest of Venezuela. Its Flag consists of three horizontal stripes: the yellow symbolizes the "Revolución Liberal Restauradora" (Liberal Restorer Revolution), example of the fights undertaken by the Tachirensians on 1874 to liberate the Country from the ruling anarchy at these times; the black recalls the historical seat of honor of Táchira like the first State where take place the first exploitation of Petroleum in Venezuela (Petrolia Estate, Rubio) and the red one represents the Tachirensian blood spilled in the Independence and the pro-democratic fights. At the center of the flag and on the black strip appear four white stars and two crossed branches of fruitful coffee: the stars remember the four Cantons that gave origin to the Táchira Province on 1852 (Lobatera, San Antonio, La Grita and San Cristóbal) and its white color is the same one that adopted like emblem the Tachirensian Joint Holders in 1753. The coffee branches symbolize the more important agricultural product of the State. Historical Synthesis: The Deputy Consuelo Báez de Celis, presiding the Commission of Legislation of the Legislative Assembly of the Táchira State with the support of Deputies Roso Julio Chacón and Ignacio Andrade, impel decisively the project for bring an own flag this federal entity. By such reason, the Academy of History of the State was convoked for the presentation of several projects made by important Tachirensians interested in the matter. After several meetings of work, the initial project of Mr. Mario Díaz was approved on June 19th, 1997. After culminated the artistic reproduction and chromatic justification, it was enter in force the Law of Symbols and Seal of the Táchira State, and with its the State Flag. The Legislation Commission of Tachira's Legislative Assembly decided in 1997 to adopt a representative flag for the State, as other states had made. The presidency of the correspondent Commission fell on Deputy Consuelo Báez de Celis, with Roso Julio Chacón and Ignacio Andrade as the other integrants of the commission. The Commission ad dressed the Academy of History, which summitted several projects, as did other culturally outstanding citizens of Tachira. The project sent by Mario Diaz was approved on 19 June 1997, then following the corresponding legislative procedure until the final approval of the State of Tachira's Symbols and Seal Law of. The hoisting took place on 12 October 1997. The flag is horizontal, yellow, black and red. Yellow symbolizes the restorer Liberal Revolution of 1874 against President Guzman Blanco, whose main cent er was Tachira, repressed on blood after some months of struggle. Black represents the state's oil wealth, Tachira being the first where this product was exploited (in La Petrolia ranch, municipality of Rubio). Red is the blood shed by the people of Tachir a in the independence struggle and in the liberal revolutions. The flag contains in the black band four white five-pointed stars, one for each of the constituent districts of the State of Tachira in 1852 (Lobatera, San Antonio, La Grita, San Cristobal). White is the color used by Tachira's Comuneros in the time of the Spanish Captain General Felipe de Ricardos. It also contains two branches of coffee, the state's main produce. The flag at <www.tachira.gov.ve> has different position of the lower stars. Semiology : The field alludes to the exuberance of Tachirensian valleys displayed on the Andes Mountains foot. The lady represents Venezuela vigilant of her borders because the river not only gives name to the Táchira state but that it is, in addition, an international landmark. The stars represent the nine original districts which integrated the Tachirensian territory. The ears, the branch of cotton and the branch of coffee, represent the fertility of the region. The pennant in gules remembers the courage of the Tachirensian People and the golden pennant with the ephemeris reaffirms the glory of their history and its bond with the Venezolanity. Historical Synthesis: Created by the Painter Don Marcos Mariño in 1913, this CoA is effective according to establishes Article 10 of the corresponding Law.